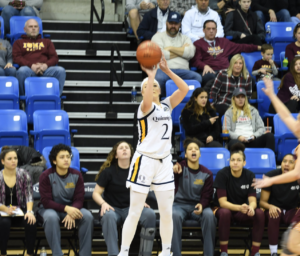 The Quinnipiac women’s basketball team has won the MAAC regular season title for the fourth-straight year and will go into the MAAC Tournament as the No. 1 seed. Even though it’s become the norm for the Bobcats to perform this well in conference play, there’s something different about this year’s team compared to the last three. Is it the fact that they’re wearing new jerseys this season to go along with the school’s new uniform provider deal with adidas? Probably not, but it’s fitting that this year’s team has a new identity to it after making the Sweet 16 last season. Quinnipiac head coach Tricia Fabbri usually schedules a tough non-conference schedule before conference play each season, but this year’s was unnecessarily tougher compared to years past with four games (all on the road) against power conference teams and seven games against teams who are currently in the top 40 in RPI poll. In that stretch, the Bobcats went 6-5. 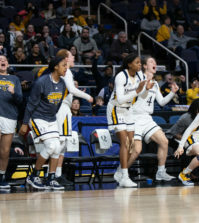 But the moment conference play began, Quinnipiac flexed its new muscles on the MAAC, going 18-0 in conference play, making it the second time it has gone undefeated in MAAC play. In those 18 games, not only did the Bobcats win — they dominated. 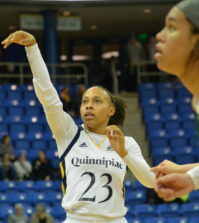 Quinnipiac’s average margin of victory was 22.1 points and only won three games by single-digits. But it isn’t just the team-dominance that’s brought the Bobcats to where they are. On Monday, redshirt junior forward Jen Fay and junior forward Aryn McClure were both named to the All-MAAC First Team, marking the first time in program history that two players have made an all-conference first team. Fay averaged 14.9 points per game (PPG) in conference play this season, which was good for seventh place in the MAAC, and grabbed 6.7 rebounds per game (RPG), which was good for 10th in the MAAC, while averaging just 26.9 minutes per game in conference play. Her scoring average is the highest for a Bobcat in conference play in four years when Jasmine Martin (‘15) averaged 15.8 PPG in 2013-14. But what made Fay a top-talent in the conference this season was her shooting numbers. 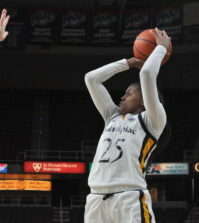 Fay was first in the MAAC in field goal percentage (55.2) and 3-point percentage (48.7). She was also fifth in the conference in free throw percentage, shooting 83.3 percent from the stripe. McClure, who was the conference’s preseason player of the year, ranked 14th in the conference in scoring (13.1 PPG) and rebounding (6.0 RPG) while averaging just 27.8 minutes per game. Like Fay, McClure was amongst the league’s best in other stats, like field goal percentage (fifth at 47.6) and assist-to-turnover ratio (second at 2.8 assists for every turnover). Fay and McClure are frontrunners for the MAAC Player of the Year, which will be named on Friday. The one player that ranks ahead of McClure in assist-to-turnover ratio is her teammate, senior guard Carly Fabbri. Carly Fabbri had a career-year in 2017-18, leading the MAAC in assists per game (APG) with 4.7, finishing second in 3-point percentage (45.8) and third in field goal percentage (49.6). Those numbers earned Fabbri a spot on the All-MAAC Third Team, the first time she’s made an all-conference team in her career. But with that said, this isn’t Fabbri’s first time on the big-stage, and the veteran knows that every game from here on out carries more importance than the last. It should be noted that if the Bobcats don’t win the MAAC Tournament, they’ll still get to play in the WNIT because they won the regular season title. But that isn’t Quinnipiac’s goal after last season. 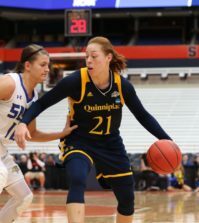 Quinnipiac has also gotten contributions for its two other starters, junior forward Paula Strautmane and sophomore guard Taylor Herd. Strautmane ranks eighth in steals (2.1 per game) and second in blocks (2.0 per game). Herd, who became a starter when Vanessa Udoji suffered a season-ending injury in December, is 10th in the MAAC in 3-point percentage (34.0) and sixth in 3-pointers made (33). These individual performances helped Quinnipiac have a strong regular season, which something that Tricia Fabbri applauds as it would’ve been easy to look over the competition. When they go up to Albany for the MAAC Tournament, the Bobcats will have two things going for them outside of their talent. The first is that the team is well rested. Even though the team has won every game this season, not one Bobcat was ranked in the conference’s top 30 in minutes played during conference-play. That is huge because Quinnipiac will have to play three games in four days if they want to win it all. The second thing that is going in favor of the Bobcats is that the team that has played them the closest this season, Marist, is on the other side of the bracket. That means the Bobcats won’t face the Red Foxes until at least the title game. Of the three games that the Bobcats won by single-digits in conference play, two were against the Red Foxes. The first was a 62-56 win at home on Jan. 11. The second was an 80-74 double overtime win on the road on Feb. 18 that clinched the regular season title for the Bobcats. So, even though Quinnipiac has a different identity on its uniforms this season, it should be expected that the Bobcats repeat as MAAC Tournament champions and win their third title in four years. Winning a tournament isn’t easy, but according to Tricia Fabbri, the Bobcats’ experience will also help them in the tournament.